A $9 shuttle fee is required for all people over the age of six for standard one day floats listed below. Shuttle fees vary for other one day floats, multiple day floats and private shuttles – please call for pricing. PFDs (personal flotation devices), paddles and mesh trash bags are included with your rental. We have PFDs to fit infants, toddlers, children and adults. For your planning purposes, please be aware that the possession of glass containers and polystyrene coolers (commonly known as Styrofoam) are prohibited while floating or camping along the Buffalo River. Thank you for helping us keep the river beautiful. Cancellations less than 14 days prior to float date are non refundable. The reservation can be rescheduled to a date within the current season. Rescheduled dates are based on availability. We float rain or shine however you can reschedule your float to another date within the current season if we deem the river is unsafe due to high water level or severe weather. Rescheduled dates are based on availability. The estimated time of 5-6 hours is based on the river level in the moderate category. Your time will vary based on how often and how long you stop, if you paddle or float, fishing or not, etc. Approximately 1.6 miles downriver from Baker Ford is Arnold Island which is the largest island in the Buffalo. The original river channel is to the left. It is scenic, but impassable in low water. During high water, use caution threading through the willow jungle at the lower end of the island. Arnold Island and Arnold Bend are named after a pioneer family. A ferry once carried residents and the mail from St. Joe. 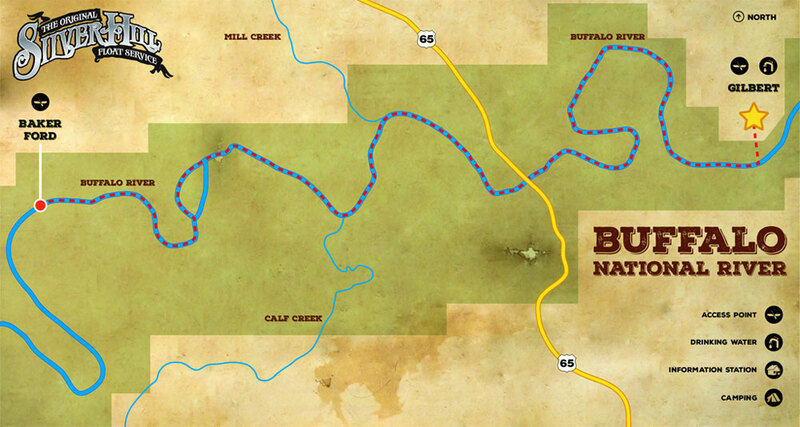 Approximately 3.2 miles downriver from Baker Ford you will see where Calf Creek flows into the Buffalo from the right. Use of this area dates to a prehistoric Indian settlement. Another .8 of a mile Mill Creek joins the river from the left. Tyler Bend is on your right. You have floated approximately 4.3 miles from Baker Ford. You are approximately 1.1 mile from Highway 65 Bridge/Grinders Ferry and approximately 5.4 miles to Gilbert. Please check out the Tyler Bend and Grinders Ferry tabs for more info on your journey down river. *Information from "The Ozark Society's Buffalo National River Canoeing Guide"
The estimated time of 3-3.5 hours is based on the river level in the moderate category. Your time will vary based on how often and how long you stop, if you paddle or float, fishing or not, etc. The right bank of the river at Tyler Bend is the site of individual and group campgrounds, picnic area and the parkâs main visitor center. A paved road connects this visitor facility with US Highway 65 at Silver Hill.A 1 mile trail leads hikers from the visitor center upriver to excellent views of the Calf Creek valley. Another .5 mile of walking brings you to the log house and farm settled by the Sod Collier family in the 1930's. The Tyler Bend campground occupies the proposed site of the Gilbert dam, which would have backed the Buffalo River up as far as Pruitt. The name of this area recalls the farm of Peter and Eveline Tyler, who were early residents. You are 1.1 mile from Highway 65 Bridge/Grinders Ferry and 5.4 miles from Gilbert. The 1.1 mile stretch between Tyler Bend and Highway 65 Bridge is a good option if you are interested in floating the Buffalo on tubes. The estimated time of 2-2.5 hours is based on the river level in the moderate category. Your time will vary based on how often and how long you stop, if you paddle or float, fishing or not, etc. The canoe access is on the right, .2 miles downstream from the bridge. The Highway 65 Bridge is another example of changes in river crossings. Grinders Ferry operated here from the 1870s until the 1929 construction of a concrete deck arch bridge. A new bridge was completed upstream in 1990 to meet the needs of increasing traffic. Lane Bend which is another horseshoe bend in the river, named for early settlers is 1.6 miles downriver of Highway 65 Bridge. Another 2 miles downriver is Boom Hole. A power line crossing marks the place where logs were once loaded from the river to a railroad siding. The Gilbert river access is around the bend on the left. With the arrival of the railroad in 1902, Gilbert became the hub of Buffalo River commerce. The 1915 flood washed away the saloon, which used to stand on the left bank. Past the landing on the left was the railroad depot and city spring. Their sites are now obscured by vegetation. The Buffalo River Trail follows the old railroad bed downriver for 2 miles to the site of a former railroad bridge. We can customize your multiple-day float based on your time, your desired daily travel distance, river and weather conditions, experience level of floaters, etc. to provide you with a memorable experience. The Buffalo River has much to offer on and off the river. In addition to floating, there are several sightseeing and hiking opportunities along the river. Our multiple-day float options are endless. For the most part, you can set up your primitive campsite anywhere along the river. Since these are remote sites, there is no trash collection. Please remember to pack it in–pack it out to keep this river beautiful for the next person. For additional "things to know" about the river, please visit our River Information page. Contact us to start customizing your multiple day/night adventure!